I’m at it again. I suspect that September 11th, 2018, will go down in history as the date chosen far in advance for the anticipated sister event to the 2001 World Trade Center and Pentagon attack exactly 17 years earlier. As usual I have my reasons and will henceforth endeavor to make the reasoning sound less crazy to those uninitiated into the complexities of occult traditions and thought. Truth is stranger than fiction but please forgive me in advance for being the less suitable person on earth to commit sound logic based on serious occult study into barely lucid prose. First and foremost it should be noted that on this date this year, Jews will be celebrating the New Year/Rosh Hashanah, as will Muslims (1 Muharram), as will Coptic Christians – the largest Christian denomination in the Middle East. These three unique calendar systems very rarely synchronize in this fashion. Since October 2014 when I first predicted a false-flag attack against the Mecca Clock Tower, Grand Mosque and Kaaba, much has happened in the world. Most of these events have steered the trajectory of international geopolitics in the engineered direction I have written about over the last four years – admittedly rather sporadic as this blog has been more of a hobby than a serious endeavor. Hobby as it may be, I have been anticipating such a Mecca Clock Tower false-flag to be the catalyzing and crowning achievement of a Zionist agenda so destructive to the world order it should be taken very seriously indeed – especially the occult, racial, and religious aspects of these Masonic and Kabbalistic rituals which are mass human sacrifices no less! The relentless mainstream media onslaught of absurd propaganda starting with the 2014 Ukraine tensions, followed by the anti-Russian MH17 false-flag, followed by chaos in Libya, followed by an endless assault against the Assad regime in Syria and now the destruction of the Shia in Yemen, seems to be climaxing around a final push to justify an open assault on Iran. By ‘justify’ I should clarify: Plausibly condemn to oblivion using an engineered consent built on spurious moral reasoning; “Chemical weapons … mass murderer … gassing his own people … weapons of mass destruction,” the usual blitzkrieg of bold faced lies. The limited segment of the western public who seem to become outraged by repeatedly having their intelligence insulted never ceases to amaze me. For instance, when exactly will Nikki Haley receive her long deserved Oscar for best method actor? How Haley can keep a straight face so consistently without bursting into laughter at her own hubris is clearly an explanation only God himself will have her explain one beautiful, just, day. Iran has always been the primary target of the NATO-Saudi-Israel axis seeking to control the power politics of the ‘world island’ – as Mackinder referred to Eurasia. Persia is the veritable pivot of world history; especially in relation to east-versus-west military conflict but especially regarding the destiny of the Jewish people once enslaved in Babylon. The elite of these Jews, having now captured the pinnacles of power in the western world – especially the Anglo-American world – have the ascendancy and are using it to create an enslavement of their own design. There has never before reigned on earth a group of highly networked individuals so powerful and deceptive, yet so well cloaked behind an opaque veil of secrecy, deception, and misdirection. The old New York City World Trade Center site was also officially 7-Towers; the Twin Towers were the two largest of the seven numbered World Trade Centers within one large complex. If you can’t identify the purposefully built ritual sacrifice device, please return to your mainstream media induced Jewniverse coma – you have accidentally awoken, go back to sleep. Whereas I initially believed the Mecca Clock Tower false-flag scenario to be blamed on the amorphous ISIS/ISIL/Daesh/Whatever(!) anti-Assad forces whipped up by Saudi Arabia and Israel under a protective and actively belligerent NATO umbrella, it has now become clear that this event – which will eclipse the 2001 WTC false-flag attack – will certainly be pinned dishonestly on Hezbollah, probably using the Houthi rebels in Yemen as a proxy and the ongoing Shia versus Sunni conflict in this region as a smokescreen. This will provide a plausible casus belli to invade Yemen and Iran, paving the way for NATO to take down Bashar al Assad in the process, allowing Israel to achieve its long desired balkanization of this unfortunate victim country. This assured Syria regime change and balkanization campaign will bring the USA and Russia into an inevitable head-to-head conflict. China will also no doubt wait in the wings with baited breath, finally casting its dice to secure energy security by backing Iran and bolstering the strength of the Shia in Iraq, perhaps also clearing the path to Persia through Afghanistan, finally, by taking on the USA in the land where Empires go to die. By creating this conflict and using the USA and the rest of NATO as a battering ram against Iran and Russia, the Zionists of the Greater Israel agenda expect to be the biggest winner, as usual. Everyone else in the western world – including 98% of Americans – will be the biggest losers. Most people will be completely ignorant of the truth driving this conflict whilst the act of telling the truth will quickly be declared akin to terrorism. Criticizing elite organized world Jewry and Zionism will be literally categorized as ‘aiding and abetting extremists’ and white westerners – in particular – found guilty of openly voicing such thought crimes will be declared ‘Nazi’s, racists, and white supremacists.’ I fully expect my blog to be shut down by Automattic Inc (owners of WordPress.com). The truth will be hunted down and nailed to a cross wherever it attempts to shed light on the actual Architects of this chaos – elite Zionists. After 2000 years there is nothing new under the Sun: The truth will be persecuted and crucified by the wicked. DO NOT FEAR: The truth is unstoppable and will triumph. 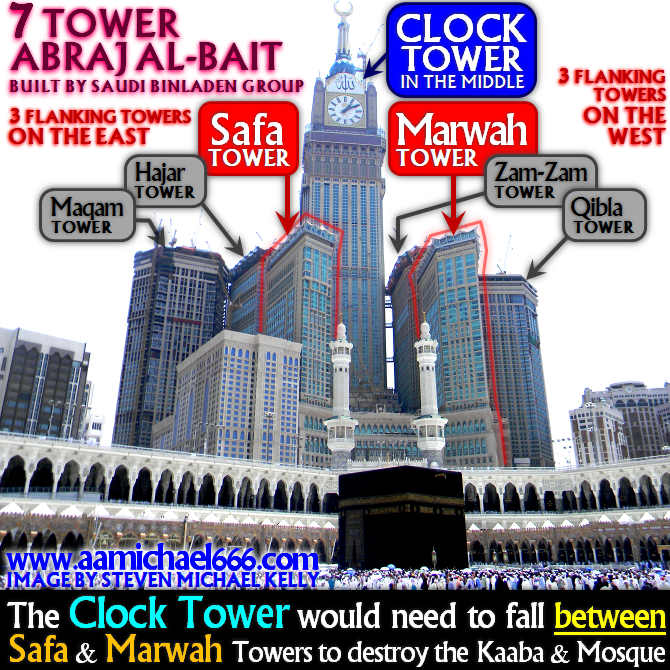 A Mecca Clock Tower false-flag attack as big as the NYC WTC disaster, to me, is a certainty. I have been silent for quite a while now regarding another date I believe such an attack might be perpetrated on – primarily because of a bad track record of past predictions concerning this event. Slow to learn my lesson, I would like to propose Tuesday, September 11th, 2018, as the date which has always been planned for this second event. In addition to various occult congruencies mentioned herein, certain geopolitical signals in the last month – especially regarding West-vs-Russia intrigues – have piqued my interest enough to put forward a theory regarding the 17th anniversary of the WTC disaster. I have suspected this date for almost a year now. The reuse of the September 11th date by the Architects of this event, might seem too bold for some readers, however, is this not the very essence of the BIG LIE technique? “The essential English leadership secret does not depend on particular intelligence. Rather, it depends on a remarkably stupid thick-headedness. The English follow the principle that when one lies, one should lie big, and stick to it. They keep up their lies, even at the risk of looking ridiculous.” – Joseph Goebbels. “Aus Churchills Lügenfabrik”, Die Zeit ohne Beispiel, January 12th, 1941. The reason conspirators are prone to engineer such big lie events around a ‘remarkably stupid thick-headedness,’ is precisely because the general public are averse to contemplating complex dilemmas for more than ten minutes. Most people instinctively search for the easiest and cleanest solution – especially with regards to geopolitics – which is usually, unfortunately, the repetitive five course meal of complete bull excrement served up by the controlled mainstream media. Thus, a totally unbelievable but Hollywood sized event like 9/11 allowing the public to be whipped into frenzy, always works a charm. The dangers of large groups of people and their inherent group-think has always been the number one enemy of truth. Don’t mistake the Architects of this ‘thick-headedness’ to be fools; believe me, they represent a devastatingly powerful intellect, one so efficiently tuned towards destruction and manipulation as to render them, in my opinion, out of this world (possessed). The real world we experience from day-to-day is merely the outer shell of an occult onion which hides an obscure universe where the opaque, hidden world, of power and seething evil resides. 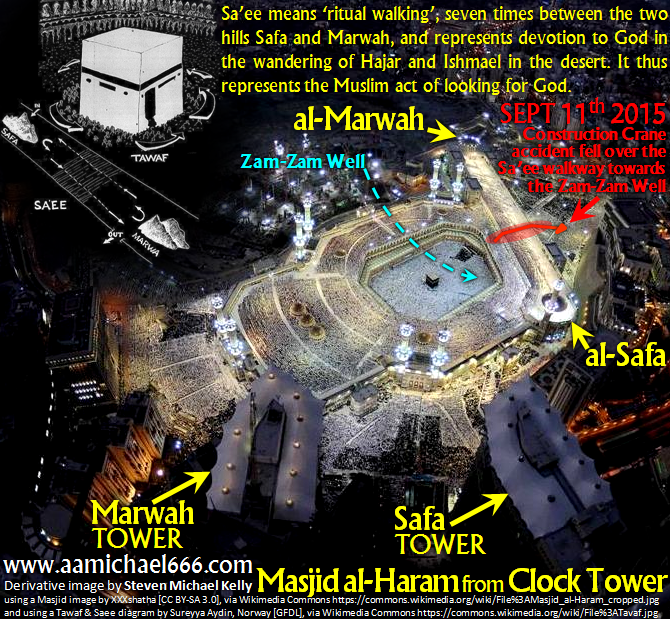 The destruction of Mecca and the Kaaba in Islamic prophecy. Various prophecies regarding the destruction of the Grand Mosque and the Kaaba – linking such an event to the Islamic End Times – are believed by hundreds of millions of Muslims worldwide. Most of these prophecies revolve around the coming of an antagonist called Zul-Suwayqatayn – described as being an ‘Abyssinian’ (Ethiopian), who will approach and destroy Mecca when “no faithful Muslim remains” and occurring directly after a rapture of the faithful Muslims presaged by a “wind from Yemen” (it’s a grab-bag for whacky interpretation). Should such a destruction event occur after which every Muslim on earth remains in situ, one can only imagine the type of religious crisis which might ensue, or, how certain manipulative religious leaders of various sectarian agendas might take advantage of the situation. Compounding with this belief is the added grenade which says this destruction will accompany the coming of the Mahdi; a religious leader which the Shia in Iran, Iraq and Yemen believe will lead them to victory over their oppressors who head the more religious Sunni nations, specifically Saudi Arabia. To deliberately catalyze such a chain of events could only be described as pure evil, yet the hordes of manipulated sheep in the western world, still convinced that September 11th, 2001, was an Islamic attack on America, will unfortunately laugh like imbeciles at such an unfortunate occurrence in Mecca without the faintest idea that 1) the ramifications will be no laughing matter for westerners, 2) that by design this event will presage, post-partum, the total loss of western ascendancy in world affairs and our cultural and social birthrights, and 3) their reactions of glee at Muslim misfortune were calculated and precisely the result and reason that the first mass human ritual sacrifice and sister event was perpetrated in NYC to begin with. These two events are designed as reciprocals to birth an Hegelian dialectic – a clash of civilizations on all levels – between East and West, that Zionists will manipulate in order to shroud their own pivotal role as Architects whilst achieving their own agendas as western nations pay the largest costs – in bodies and financial debts, the life blood of international money changing ruled by world Zionist elites. Welcome to the Blackjack table: If you haven’t identified the sucker within ten minutes … you’re the sucker! The House [of Rothschild] always wins. Well, that’s enough info regarding the purpose and the perpetrators for such a possible event, it’s time to cover a few of the occult congruencies linking the 2001 event with a possible 2018 event on the 17th anniversary date. Following is a list of the major points worth raising immediately but, if this event actually occurs and my blog stays online longer than I would expect it to under such a circumstance, then I will probably invest some time in a more thorough exposition of the ritual dynamics of these two events – including other associated events. OCCULT CONGRUENCE #1: TRIPLE NEW YEAR’S! JEWISH NEW YEAR: The first crescent moon visible at sunset after the astronomical New Moon which occurs on Monday, September 10th, 2018, at ~4:30 am UTC, represents the transition from the final to the 1st month in the Hebrew civil calendar – otherwise known as the Jewish New Year/Rosh Hashanah. Depending on the method of determining the first crescent moon, a Jew, dependent on sectarian and/or geographical location will celebrate the start of Rosh Hashanah from sunset September 9th up to sunset September 11th. For the purposes of such calendrical discrepancies – which are also a feature of Islamic lunar calendar dynamics and disputes – the New Year’s holy day came to be observed by Jews for two days (1st and 2nd of Tishri). According to the Arthur Spier Comprehensive Hebrew Calendar and online calendars used by Orthodox Jews, this 2018 holiday runs ‘officially’ from sunset September 9th to sunset September 11th, however, as previously noted, a purely Torah literalist – such as a Karaite Jew – will observe the first day of this month no earlier than sunset September 11th because a new crescent moon is not even visible from Jerusalem on the evening of September 10th but rather the following afternoon. ISLAMIC NEW YEAR: The official Saudi Umm al-Qura calendar which has controversial calculation methods for some Muslims, places the Islamic New Year in 2018 from sunset September 10th to sunset September 11th. Muslims following the traditional geo-specific and visible month transition methods of new crescent moon observance – as would a Torah observant Jew – should not celebrate the transition to the Islamic New Year until sunset September 11th. Due to the Islamic Hijri calendar being a seasonally un-adjusted twelve month lunar calendar without a thirteenth/intercalation month, the Islamic calendar only synchronizes for New Year’s transitions on the same new moons as the Hebrew calendar approximately every 33 years. COPTIC CHRISTIAN NEW YEAR: (Known as NAYROUZ) Except for leap years when it falls on September 12th, New Year’s Day falls on September 11th in the Coptic calendar which is a Julian calendar derivative in terms of tropical intercalation but the direct and only ‘living’ descendant of the Ancient Egyptian calendar. On September 11th, 2001 – which was not a leap year – it happened to be the Coptic New Year, as will be the case in 2018 during the 17th anniversary of the WTC attack. Being the only descendant of the Ancient Egyptian, the Coptic calendar holds special esoteric significance, not just to the largest Christian community in the entire Middle East but also to numerous historical and contemporary movements derived from the Gnostic traditions which developed parallel with Egyptian/Alexandrian Christianity. Gnosticism is the oldest and single most important component of the Western Esoteric tradition together with Hermeticism, Freemasonry, Tarot and Jewish Kabbala. Gnosticism, with its roots in The Orient but also a vast influential heritage in the western world, sits in opposition to Trinitarian Christianity and/or Yahwism based on its embrace of the concept of the Demiurge. Regardless, however, it is always considered part of the Christian historical milieu, often hiding behind a ‘Christian’ veneer. In large part this veneer owes provenance to the culture of Ptolemaic Ancient Egypt where Hellenistic mystery cults and the ‘Orphic’ traditions merged with late Egyptian superstitions, then was finally infused with elements of Messianism mainly via Jewish influence. Such a triple New Year with representation by the three major Abrahamic religious components in the Middle East is pivotal in fulfilling the Rosicrucian mystical process known as the Great Work; an esoteric concept elucidated in the early 1600’s work entitled The Chymical Wedding Of Christian Rosenkreutz. In this work a prospective initiate into the alchemical mysteries of personal and social transformation is invited to a wedding by a celestial being. During his dreamscape journey he attends the wedding only to discover that it is actually a triple execution and funeral of three separate but connected royal couples, one of which is described as a ‘Moor’ (Muslim), the other two seeming to parallel a Christian and a Jewish couple. Through a series of alchemical travails the symbolic substance of these three dead couples is distilled on a magical island into one new material reminiscent of the Philosophers Stone. Essentially, an interested reader will need to read this work for themselves because it is a complex precursor to the type of literature found in the Alice in Wonderland and associated stories. While seemingly obscure, the influence of this work on the western esoteric tradition should not be ignored. Reading between the lines, it basically revolves around a deliberate practical magical operation to destroy all three Abrahamic religions and to fuse them into one tradition akin to a New Age agenda. It is with this agenda that the Rosicrucian and Masonic traditions collide, aiming at the creation of a Universal Religion; one which can only be made possible utilizing catalyzing event/s which deliberately precipitate a clash of civilizations, annihilating the old religious orders present in these three Abrahamic traditions (ie, the wedding = a triple funeral), allowing a universal philosophy to arise under a World Government. #2: GEORGIA GUIDESTONES NEW YEAR RITUAL! The other main reason the Jewish New Year is important in context to a possible destruction of the Kaaba in a ritual sacrifice, is based on the fact that a bizarre Masonic ritual was performed on the Jewish New Year 2014, at the very esoteric Georgia Guidestone’s erected by one ‘R.C.Christian’ in 1982 (the 77th Thelemic year). I have written about this cornerstone ritual before where a 6x6x6 inch cube of Masonry presented as a ‘wedding gift’ between a couple calling themselves ‘Christian,’ was placed ceremonially into a pre-prepared North-East slot of the structure but cast down after 40 days and smashed ceremonially with a maul by an Operative Mason resting on his left knee (as per Masonic ritual). This was a cornerstone consecration and then execration ritual which, in my opinion, represented the destruction of the Christian Marriage Contract between Jesus Christ and his Church/Bride, but also the destruction of a Kaaba analogue (Kaaba means Cube in Arabic), occurring on the Jewish New Year’s day, 2014 – signifying the Agency responsible for the destruction of Christianity and Islam in one single act of revenge served cold. THIS POST WAS TO BE UPDATED WITH FURTHER INFORMATION BUT THANKFULLY THE EVENT DID NOT OCCUR SO I’LL LEAVE THIS POST AS IT IS. I JUST HOPE I’M WRONG ABOUT THIS EVENT BEING SETUP FOR A FUTURE DATE. ALTERNATIVELY, IF MY SUSPICIONS ARE IN FACT CORRECT, LET’S HOPE CIRCUMSTANCES HAVE CHANGED IRREVOCABLY SO THAT SUCH A PLAN IS SCUTTLED. BE SAFE. November was originally the 9th month in the calendar it was created for. The date you’re looking for is 11/11. Tomorrow.